With its rich consistency and sweet flavor, so many people enjoy a glass of eggnog during Christmas. Yes, it is a rich drink made with cream, milk and eggs, but it is only a once-a-year treat after all. There should be no reason why one should avoid a sip or two on Christmas day, at least in my opinion. The Joy of Cooking which graces so many of our homes (it was one of the first cookbooks I ever purchased) has wonderful recipes that are go-tos, traditional and downright delicious. I still cook from it and probably always will. Their recipe for cooked eggnog is a nice alternative for those of you who fear consuming uncooked eggs. The technique is very simple and it takes no time to make it. The base is essentially a creme anglaise, which is nothing more than eggs that have been tempered with scalding milk and then cooked over medium-low heat until the mixture coats the back of a spoon. Creme anglaise can be served as a dessert sauce to accompany many sweet cakes, but it can also be turned into French-style ice creams. 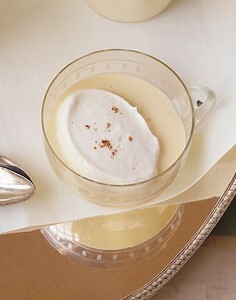 Add some more cream & milk, and then some brandy, rum or Cognac to the custard and you have eggnog! Yes, how simple is that? No worries about drinking uncooked eggs and the results are just as rich and just as delicious. Make some for your Christmas gathering and enjoy a traditional drink that is loved by many. Lightly cooking this eggnog kills dangerous bacteria in the eggs. For a nonalcoholic alternative, 2 tablespoons vanilla or 1 1/2 cups strong coffee can replace the spirits. Do not double this recipe. Cover and refrigerate for at least 3 hours or up to 3 days. Serve sprinkled with ground nutmeg.